Fourteen years have passed since we first sat at Snow Hall and learned that the 1st Battalion of the 158th Field Artillery regiment was being called up for service in Iraq. A lot has changed during that time, so let's take some time to catch up, this time with PFC champion and Dirty Dogs manager Scott Buehre. Are you still in the 158? ​BUEHRE: I am still in and will be moving back to the 1-158 in February. After the SECFOR mission, I stayed with the 1-158 and deployed as a Platoon Sergeant again during the 2008-2009 Ramadi, Iraq mission. When that deployment was over, I was promoted and transferred over to the 120th FSC (still falls under 1-158) to be the First Sergeant. I stayed with them until July 2016, when I moved to the 271 BSB to take over as First Sergeant there. I am now going back over to the 120th FSC to deploy with them as First Sergeant. BUEHRE: I live outside the big town of Cyril, Oklahoma. Where are your from and how did you make it into the 158? ​BUEHRE: I grew up in Brookings, South Dakota. After I turned down my commission in 1996, I attended another MOS-Q school at Fort Sill and moved to Lawton shortly after. I started in Alpha Battery 1-158 in Walters, moved to Bravo in Marlow, then to Duncan before moving to Charlie in Chickasha and then Anadarko. I also spent a short stint in the Lawton armory with Headquarters. I am lucky enough to be one of the few still around to have spent time in each of the old armories before they were shut down to bring in the Armed Forces Reserve Centers. ​BUEHRE: I work as a Certified Athletic Trainer, currently at Eisenhower High School in Lawton. What are your hobbies outside of FF? BUEHRE: Outside of work and the military I like to (try to) play golf and spend time outdoors hunting and fishing. BUEHRE: ​I have played since 2015 when the PFC started, so 4 years and this is the only league I play in. How many championships have you won? How many have you finished second in? BUEHRE: I have won 2 championships and came in 2nd once. You won the Patriot Bowl in 2018 (congrats, by the way). How did that come about? How did you feel about your draft? BUEHRE: I felt pretty good about my draft even though the rate my draft guys didn't agree. BUEHRE: I'm not sure what the key to success was this year. I would probably have to say staying active on the waiver wire and trading. I wasn't sure how I was going to fare after my team started filling up the IR. I was lucky to have a first round bye or I would have lost that week. Did you feel like a favorite? BUEHRE: I didn't feel like the favorite, I thought I would end up losing to Pennington in the finals if we both made it. He was putting up points like nobody's business and looked like he would walk away with it. What is your general strategy in FF? BUEHRE: My general strategy is to go for the best player available in the first round and then try to end up with either 1 RB and 2 WR or the other way around. 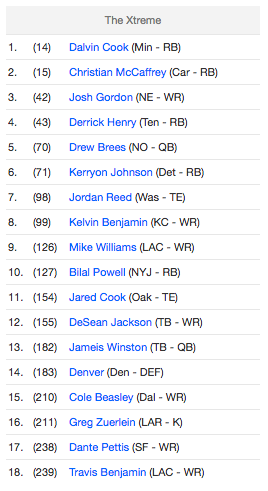 After the first three rounds I just try to get the best available player in a spot I have open. This year I was able to wait a little longer on QB and TE since we had someone monitoring the autodraft guys so they didn't get 3-4 QB's and 2-3 TE's early since they get ranked up there. What was different about this year for you? BUEHRE: This year I wasn't sure how my team was going to do after many of my top position players ended up on IR. I lucked out by having some of my later round guys step up and take their places and also by getting lucky on the waiver wire. I did work in a few trades also this year, but not all of them benefitted me that well. How much preparation did you do? BUEHRE: I didn't do that much prep, but I did download a cheatsheet to help me remember peoples value besides just the next up on the clicky draft board. Do you find you draft better at the cabin with the guys or at home online? BUEHRE: I've had luck both at home and at the cabin, but it is definitely more fun with everyone at the cabin!! Will you be at the draft cabin next year? BUEHRE: I will be at the cabin next year! Who was your team MVP? BUEHRE: My team MVP was probably my 15th round pick, James Conner, or my third round pick, Adam Thielen. They were close in points and both carried me for the bulk of the year. What was the best move you made post-draft? BUEHRE: My best move after the draft was probably grabbing Conner's back up a couple of weeks before I needed him. I also grabbed R. Wilson and D. Hamilton off the waiver wire after two more of my guys went on IR. Do you know who you're going to pick at 1.01 next year? BUEHRE: I'm not locked in on any player for sure yet for next year's first pick. Where will you display the trophy? BUEHRE: I will be displaying the trophy first at home on the mantle and then in my 1SG office at the unit. The three conference champions will submit their Week 17 lineup to the Commissioner before the games begin. The conference champion with the highest combined score over Weeks 16-17 will be crowned OIL Champions, have their name engraved on the Tenequer Memorial Trophy, and receive a custom team mini-helmet. CYRIL — Almost 111 days after the RateMyLeague.com crew ridiculed his drafting ability, Dirty Dogs manager Scott Buehre is the last man standing in the PFC. The Dogs defeated the upstart Xtreme 165.45-120.05 Monday night to claim their second championship in three seasons. 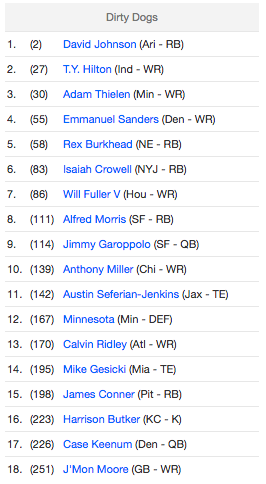 In hindsight, Buehre's draft was not that bad, aside from a horrible TE group and taking a defense too early. And he should get credit for drafting RB James Conner in the 15th round, keeping him away from the Le'Veon Bell owner. No, where Buehre's team faltered wasn't the result of draft whiffs; it was injury, as a whopping seven Dirty Dogs ended up on IR (including starting QB Andy Dalton, acquired in trade after Jimmy Garoppolo's season-ending injury, who ended up on IR himself shortly thereafter). ​But what the RateMyLeague.com crew failed to account for is Buehre's in-season management. His 26 transactions were by no means the most in the league. But the effectiveness of those moves reiterated that what's important is making the right moves. Moments after clinching the championship, Buehre had a message for those that doubted him. The Dirty Dogs were carried by recent waiver-wire acquisitions QB Russell Wilson, RB Jaylen Samuels, TE C.J. Uzomah, and WR DaeSean Hamilton, who combined for 83.55 points. Samuels was filling in for season-long starting RB James Conner, who missed the entire playoff run due to injury. Most impressively, Buehre's optimal lineup was less than one point more than his Week 16 total, displaying Buehre's superior lineup management. The Dogs went into Monday Night Football leading 149.45-119.05, but Buehre was not counting his chickens just yet. "The game was neck and neck until the Sunday night game when I got a little lead," he said. "I felt pretty good going into Monday’s game but the week seven 32 points by Denver’s defense was lurking in the back of my mind." But the Denver D/ST was nowhere to be found, and Buehre won his second championship in three tries as a result. Xtreme ​manager Jason Bellar wasn't bitter and each manager made sure to congratulate each other on great seasons. The victory lifted the Dogs to a franchise-best 12-3 record in 2018 and a 39-19 record overall. Buehre now leads the all-time series with Bellar, 3-2. With two championships in three seasons, the ​Dogs will have to be considered serious contenders going into 2019. But Buehre wasn't the only manager proving RateMyLeague.com wrong this week. Xtreme manager Jason Bellar was roasted by the RML crew, having their draft ranked last in the PFC. And, whereas Buehre was forced to make two dozen moves to account for injuries, Bellar completed only eight transactions all season, with only two (TE Ian Thomas and WR Kenny Stills) post-draft acquisitions starting the Patriot Bowl. Yes, that indicates the Xtreme were extremely lucky when it comes to injuries, but it also shows that their draft picks were exceeding expectations. Bellar was incredibly consistent (and incredibly mediocre) through his first four seasons, going 7-6 in each regular season from 2015-2017. But the Xtreme went 9-4 in 2018 before winning two playoff games to reach the Patriot Bowl. Unfortunately, when it mattered most, Bellar was let down by his top-three WRs (who combined for 3.60 points) and his special teams, as his K and D/ST combined for nine points. Regardless, even if all of those players met their projections, the Xtreme weren't catching the red-hot Dirty Dogs. The loss dropped Bellar to 11-5 on the season and 32-25 overall. The Xtreme are now 2-3 all-time against the ​Dirty Dogs. Dirty Dogs manager Scott Buehre is the only OILer to finish in last place one season, only to finish in first place the following season ("Worst to First"). Buehre's last-place finish in 2015 can be attributed to his poor decision making prior to the 2015 draft. Remember, 2015 was the 10-year reunion in Bricktown. The guys partied all night, knowing they had to get on a bus at 0600 to ride to the draft at AT&T Stadium. While everyone else at least got a couple hours of sleep, Buehre set the standard by drinking through the night without ever getting a wink of sleep. When he boarded the bus, the guys, being the blue falcons they are, kept handing Buehre beer the whole way down to D/FW. By the time Buehre drafted the 2015 Dirty Dogs roster, he had been drinking for 24 hours. It's no wonder his draft sucked. But he redeemed himself (and did his liver a favor) in 2016 by not​ drafting drunk, and he rode that sober draft to his first championship. PFC Commissioner Scott Buehre unveiled the Dirty Dogs logo and uniforms Tuesday morning. With the unveiling, we are one team closer to decking out the entire PFC. Thanks to Michael Taylor for the design work.